Our unique blend of distance learning and hands-on clinical training brings med school to you. Oceania University of Medicine students have the best of all worlds…The challenging preclinical program is presented online followed by traditional clinical rotations arranged at affiliated teaching hospitals. Graduates are currently practicing or training in Australia, Canada, New Zealand, Samoa, and United States. If you always dreamed of becoming a physician but “life” got in the way, Oceania University of Medicine is right for you. The preclinical online classes allow non-traditional students to balance school with work and family obligations. 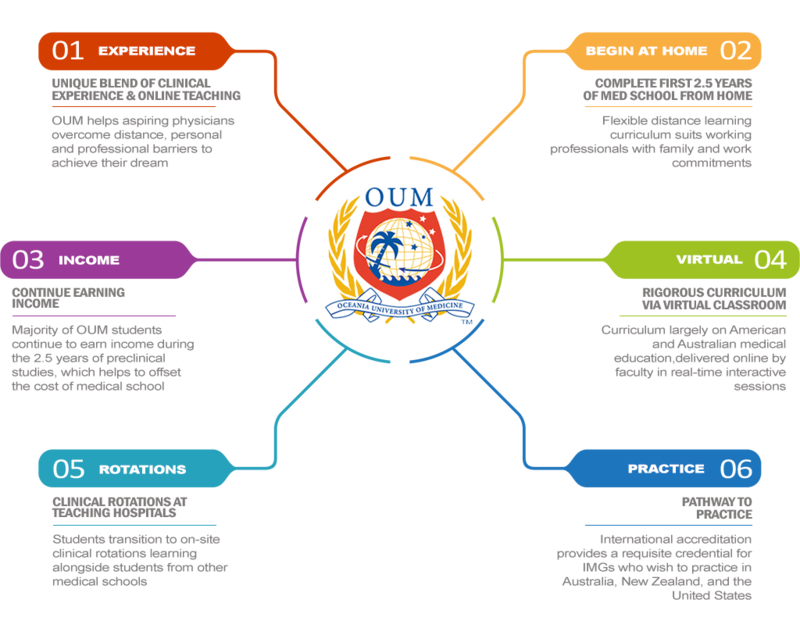 The median age for OUM students is 40.5 with a range from 22 to 62 years of age. The rigorous curriculum is based largely on American and Australian medical education models. The program is typically completed in four-and-a-half to five years. Accreditation provides a requisite credential that medical school graduates need for licensure and post-graduate training. Welcome to the Oceania University of Medicine on-line application. Application Fee: The application fee of $250 USD must be received before your application begins processing. Please note that $100 of the application fee will be credited to your tuition fee. See the Admissions page for payment details. Please check that all details are correct and complete (* indicates required information). If you have difficulty completing the online application, please contact the Admissions Office. Have you Spoken with a representative from OUM?pick one! Do you have good computer skills?pick one! Do you own a laptop computer?pick one! Waive right to access reference informationpick one! In order to engage prospective students and others interested in learning more about OUM, special events provide a front row seat to live online discussions with students, alumni, faculty, and deans as well as access to selected classes themselves.